Meatball lovers are invited to gather at barbacco every Monday evening for our new dinner series – Meatball Mondays! Each Monday Chef Miguel will feature three different meatballs, including our popular Polpette (referring to by 7×7 as ‘amazeballs’) and two other choices varying from beef and lamb, to chicken and fish. Guests can order any three meatballs of their choice for $16, served with complimentary spaghetti a la marinara. Seasonal side dishes from the regular menu can be added to the dinner as well. To round out the meal guests can choose from an extensive wine and beer list, especially selected each week by our manager Ilenia. 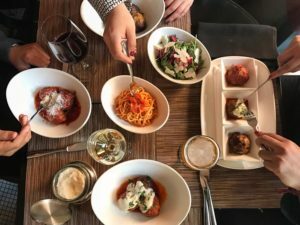 To join us for an upcoming Meatball Mondays, please make reservations by calling (415) 955-1919 or online here.